Ms. Caroline Amplatz has been a philanthropist of several local organizations for many years. HASTINGS, Minn. — The Hastings City Council said on Monday that it has received a large gift from a well-known donor to go towards fixing soccer fields in Hastings that were recently vandalized. Police say the Vet's Athletic Complex soccer fields were ripped apart by the wheels of a vehicle driven by two local men. The council accepted a $100,000 donation from Ms. Caroline Amplatz. Ms. Amplatz has been a philanthropist of several local organizations for many years. In 2009, she pledged $50 million to the University of Minnesota to build a children's hospital, according to the Star Tribune. The article says that she donated the money in honor of her father, who was a prominent member of Minnesota's medical device community. The Star Tribune wrote about Ms. Amplatz again in 2015, when she gave $3 million to the Cowles Center for Dance & the Performing Arts to rebuild its Arts & Education Wing. 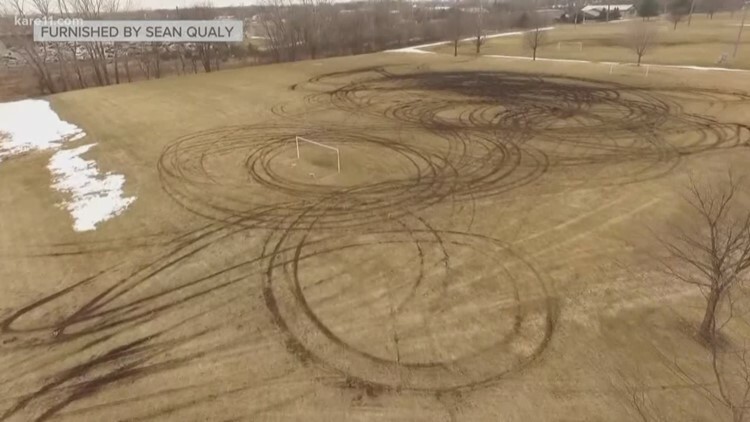 The fields were damaged on March 24 by two men who did donuts on the fields, destroying an estimated 200,000 square feet of turf. Edward Lee Mears and Asa Alden Soine were charged with criminal damage to property in the 1st degree, which is a felony. A landscaping employee had said it would cost $137,000 to fix the fields, according to the criminal complaint. The Hastings City Council targeted Ms. Amplatz's donation for field repairs and will be hiring Precision Landscaping and Construction, Inc. to do the job. "We are extremely grateful to be the recipient of such a meaningful donation," stated Parks and Rec Director Chris Jenkins. "The generosity shown by Ms. Amplatz will allow the soccer playing youth of Hastings to return to their home fields this season. This outcome is very fortunate for our city and for the hundreds of players affected by the situation." The Hastings Parks & Recreation Department says it hopes that the fields will be ready for games sometime in May. The Hastings Futbol Club (HFC), a local youth soccer organization, has 125 games scheduled at Vets Park between April 30 and June 3 alone.